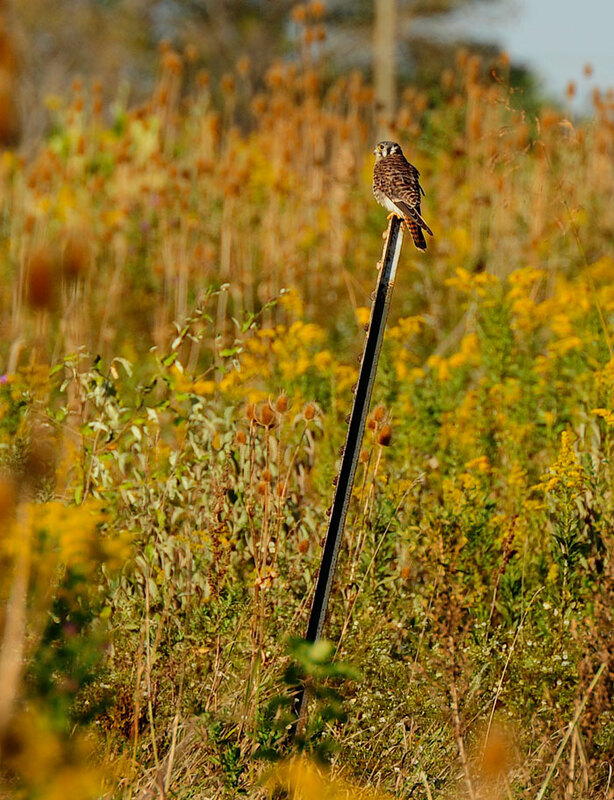 Back in the autumn, Matty and I went on a photo shoot at RAPTOR, Inc. (a rehab facility for injured birds of prey). Most of the birds at RAPTOR are treated, rehabilitated and released, but some are so badly injured they can not heal well enough to survive in the wild. 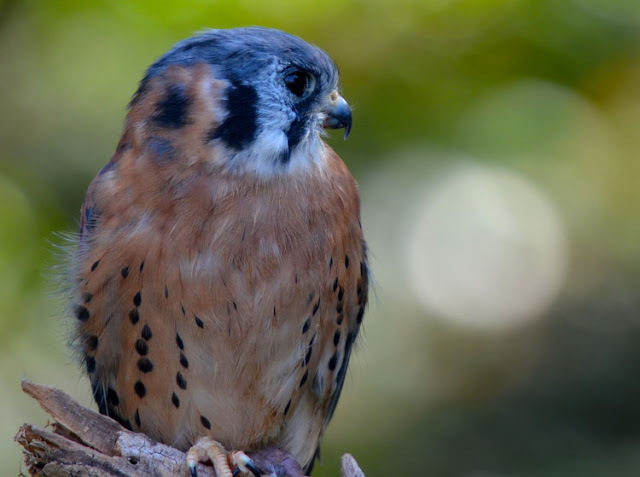 "Steel" is an American Kestrel that is blind in his left eye, making it impossible for him to hunt. He stays on at RAPTOR, Inc. as a teaching bird. 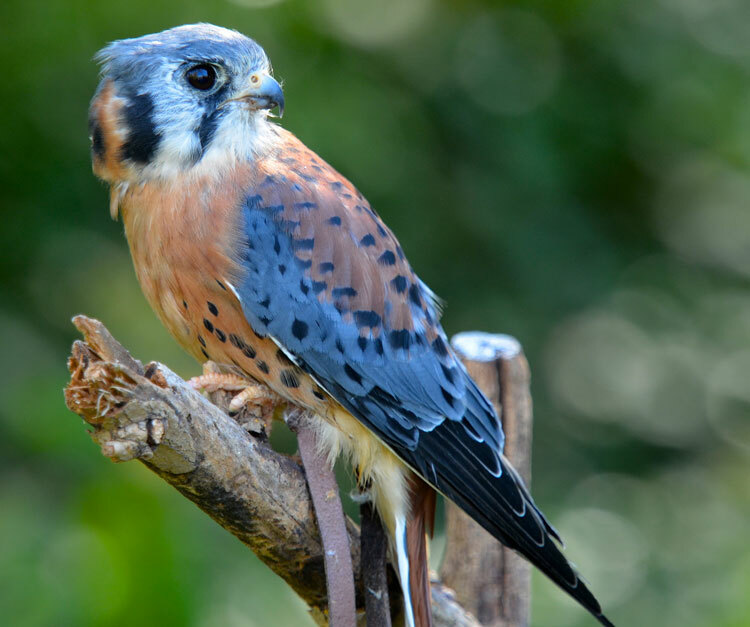 "...it looks like a tiny aristocrat, with an intricate tapestry of white, blue, and reddish feathers..."
"The American Kestrel is a superbly designed, compact falcon with unusually elegant plumage. I think it looks like a tiny aristocrat, with an intricate tapestry of white, blue, and reddish feathers on its upper body and a breast decorated with dark ermine markings." 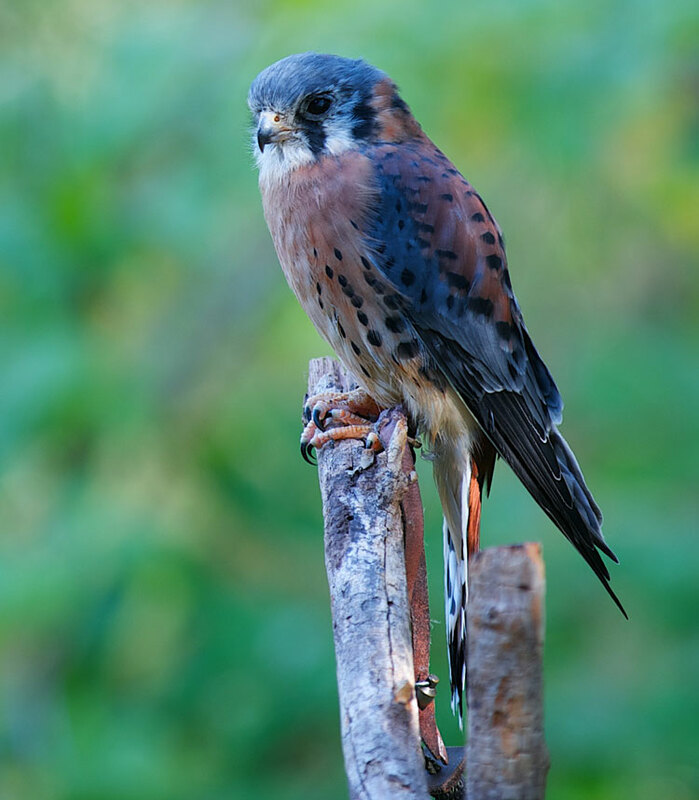 The black bars under a kestrel's eyes are beautiful, but their purpose is more than just esthetic. The dark color absorbs bright sunlight to help reduce glare when the bird hunts. ...and the pair of large black spots on the back of his head....they serve a purpose too. They are ocelli (false eyes) and may make a predator think twice about attacking a kestrel from behind. Since ocelli look like a pair of eyes, predators may assume the bird is facing them. I took this photo of a female American Kestrel back in October of 2010 at VOA park. Even though the bird was far away and detail lacks, I like it because it's a good example of a kestrel's tendency to perch-hunt. The field was ringing with the sound of grasshoppers, and I assume the kestrel was filling up on the insects! 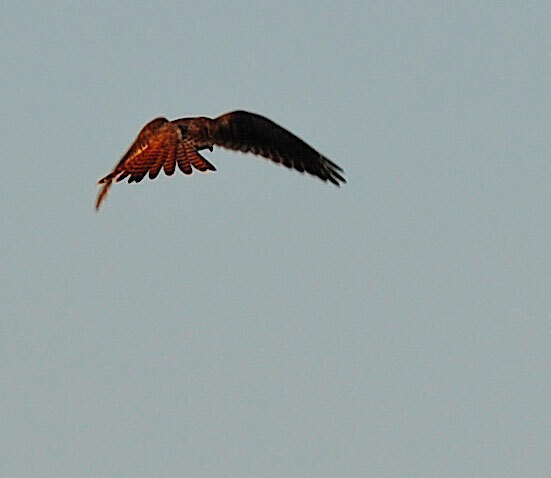 ...and just a little later, the kestrel took to the wing to hover-hunt. American Kestrels use the wind velocity to hover. Even though they stay in the same spot while flapping their wings, they don't hover like hummingbirds (which use a figure-8 wing motion to hover). Instead, they fly into the wind at the same speed of the wind, which results in stabilized hovering. Interesting bird and great photos. I really like the fact that there are places out there that will help out a wounded bird if one can be saved. Poor guy! But at least he has a second chance. I love the watercolor, that is beautiful. A big cheer for Kelly's wonderful art work - and I have to throw it a nice plug for the current ABA Bird of the Year! I was excited to see you were today's contributor! And I wasn't disappointed. What a tremendous post about the ABA Bird of the Year, full of beautiful pictures, a striking painting, and lots of information that I'll need to go back to read so it will sink in!! Thanks, Kelly! The watercolor portrait is wonderful! Great images of one of my favorite little raptors. Love the watercolors. 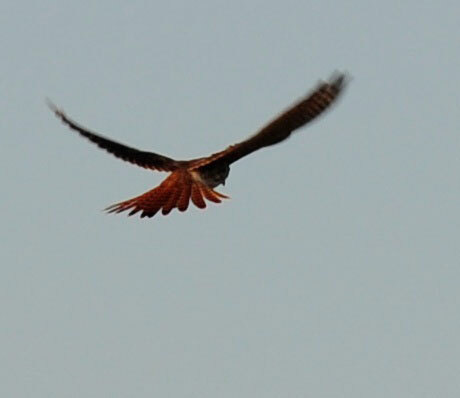 Fantastic post and photos on the Kestrel. Great painting, Kelly! Kelly, I so enjoyed scrolling throught this wonderful post! 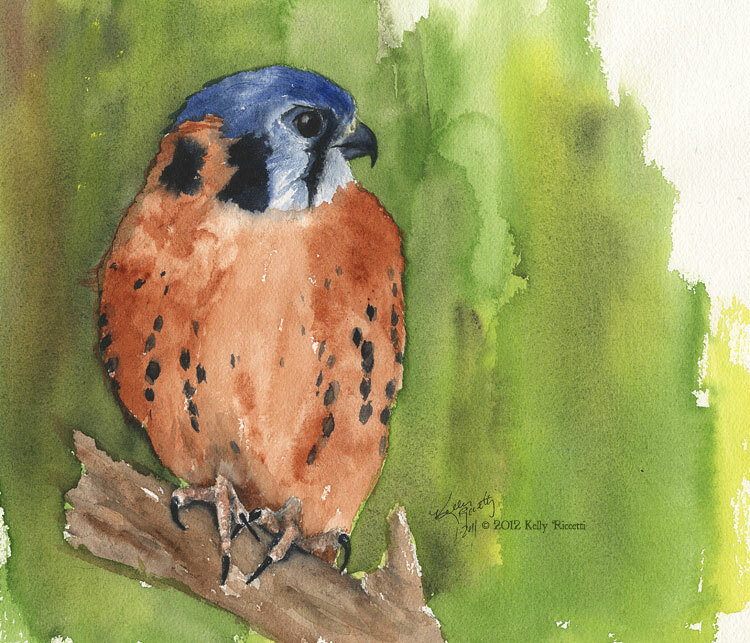 Your watercolor of the American Kestrel is especially beautiful! You captured the stunning feather colors so well. 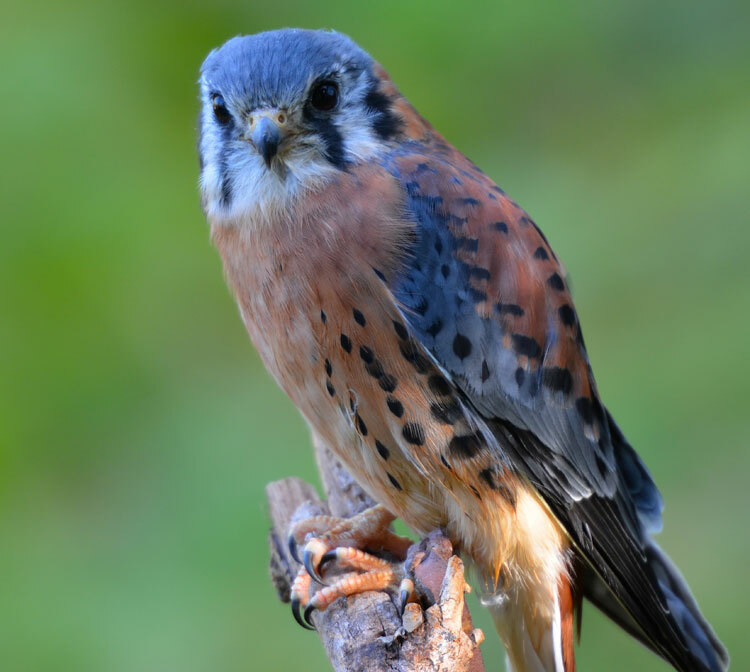 I did not know that kestrels have ocelli ... I learned something new today. I am so glad that there are places like Raptors, Inc. that rehabilitate injured birds and nurture them if they are not able to be released. It's always a joy to view one your outstanding blog posts!